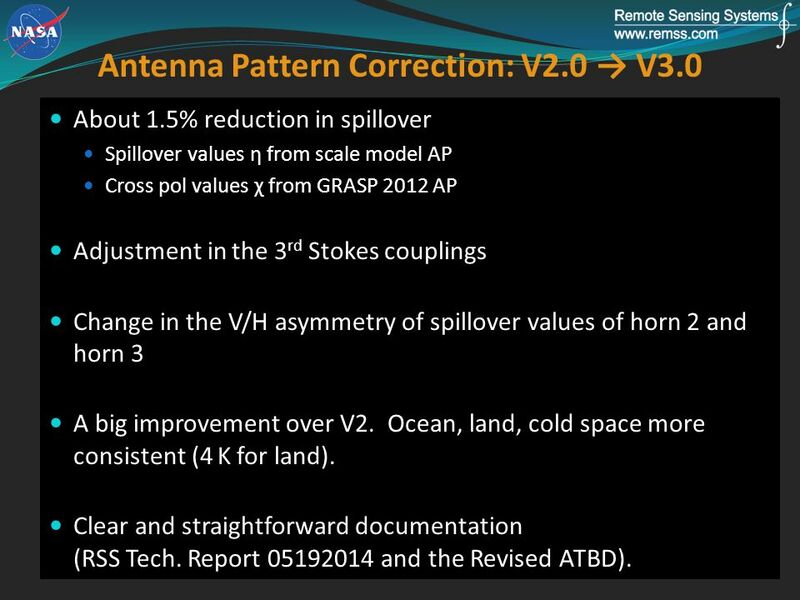 7 Antenna Pattern Correction: V2.0 → V3.0 About 1.5% reduction in spillover Spillover values η from scale model AP Cross pol values χ from GRASP 2012 AP Adjustment in the 3 rd Stokes couplings Change in the V/H asymmetry of spillover values of horn 2 and horn 3 A big improvement over V2. Ocean, land, cold space more consistent (4 K for land). 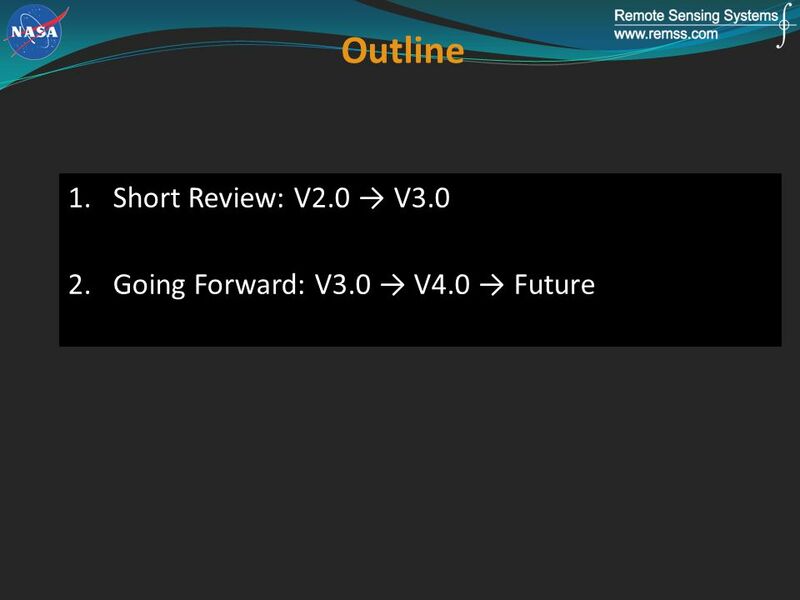 Clear and straightforward documentation (RSS Tech. 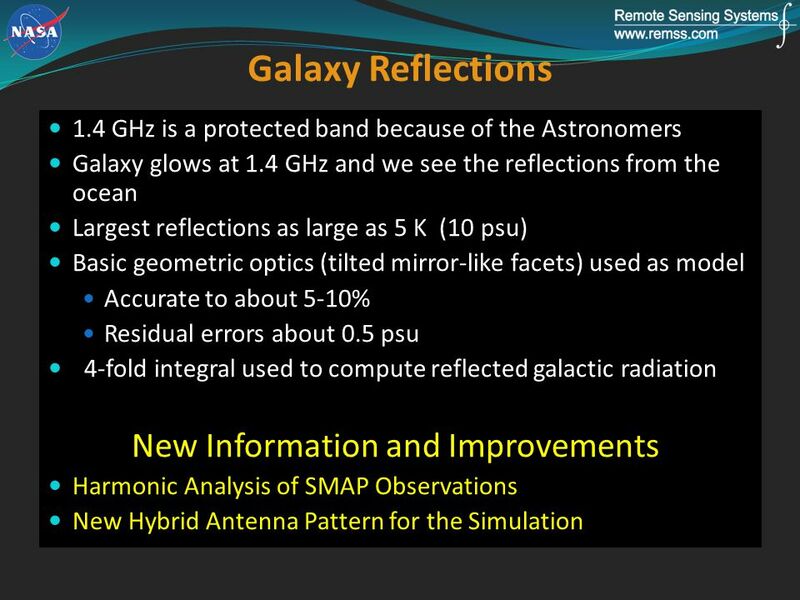 Report 05192014 and the Revised ATBD). 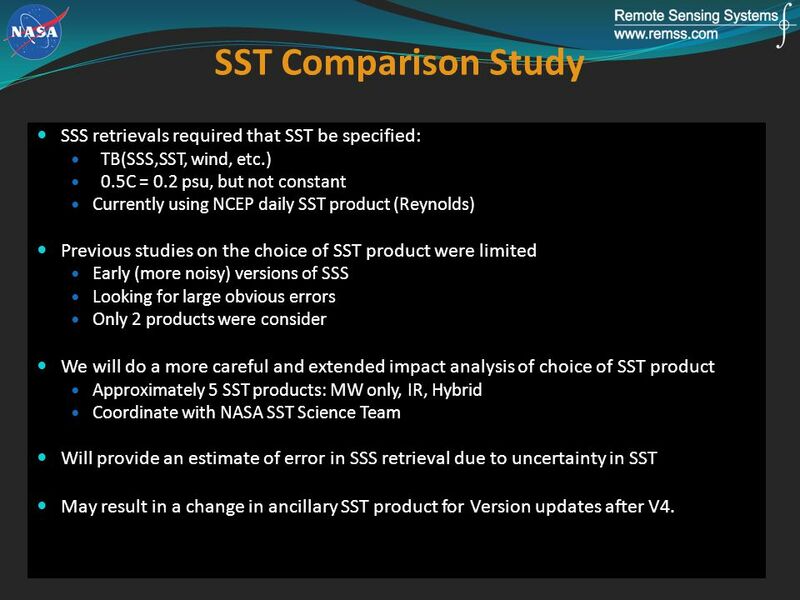 12 SST Comparison Study SSS retrievals required that SST be specified: TB(SSS,SST, wind, etc.) 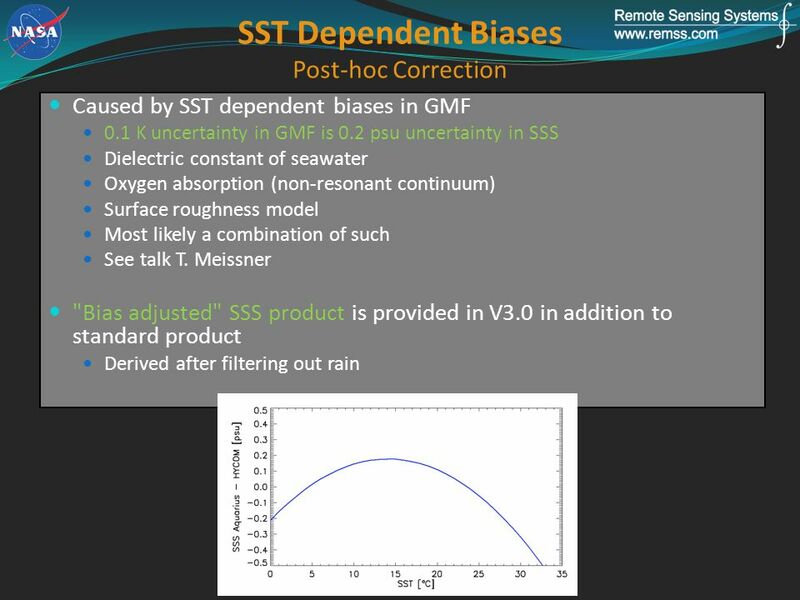 0.5C = 0.2 psu, but not constant Currently using NCEP daily SST product (Reynolds) Previous studies on the choice of SST product were limited Early (more noisy) versions of SSS Looking for large obvious errors Only 2 products were consider We will do a more careful and extended impact analysis of choice of SST product Approximately 5 SST products: MW only, IR, Hybrid Coordinate with NASA SST Science Team Will provide an estimate of error in SSS retrieval due to uncertainty in SST May result in a change in ancillary SST product for Version updates after V4. 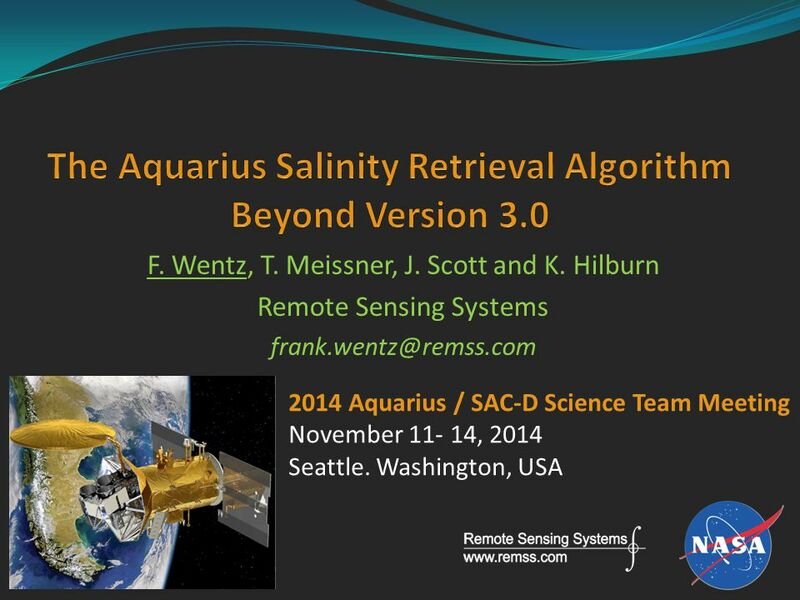 Download ppt "F. Wentz, T. Meissner, J. Scott and K. Hilburn Remote Sensing Systems 2014 Aquarius / SAC-D Science Team Meeting November 11- 14,"
On the use of observations from the Aquarius/SAC-D mission to study the cryosphere Emmanuel Dinnat 1,2 and Ludovic Brucker 1,3 1. Cryospheric Sciences. L1a to L2 Aquarius Processor Frank Wentz and Thomas Meissner Aquarius Algorithm Workshop, Santa Rosa, CA, March 9-11, 2010. 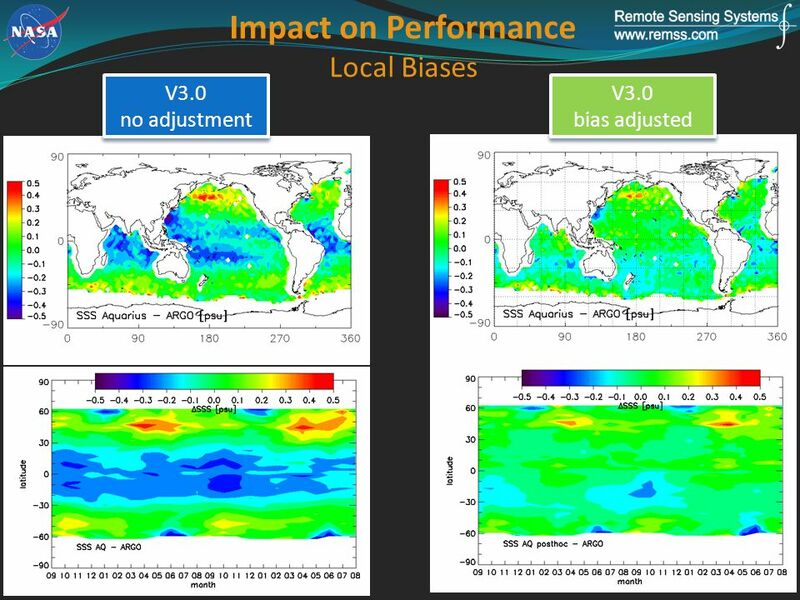 SMOS L2 Ocean Salinity Level 2 Ocean Salinity Using TEC estimated from Stokes 3 24 October 2012 ACRI-st, LOCEAN & ARGANS SMOS+polarimetry. 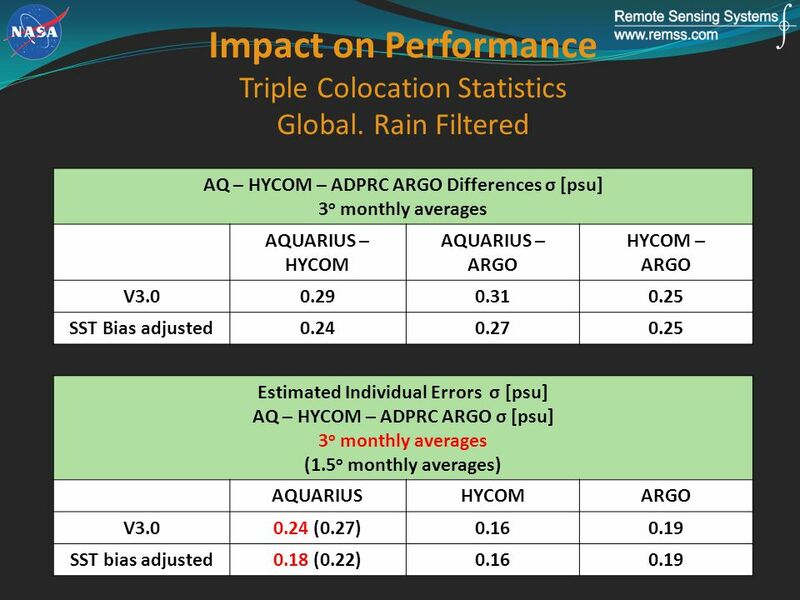 Calibration and Validation Studies for Aquarius Salinity Retrieval Shannon Brown and Sidharth Misra Jet Propulsion Laboratory, California Institute of. 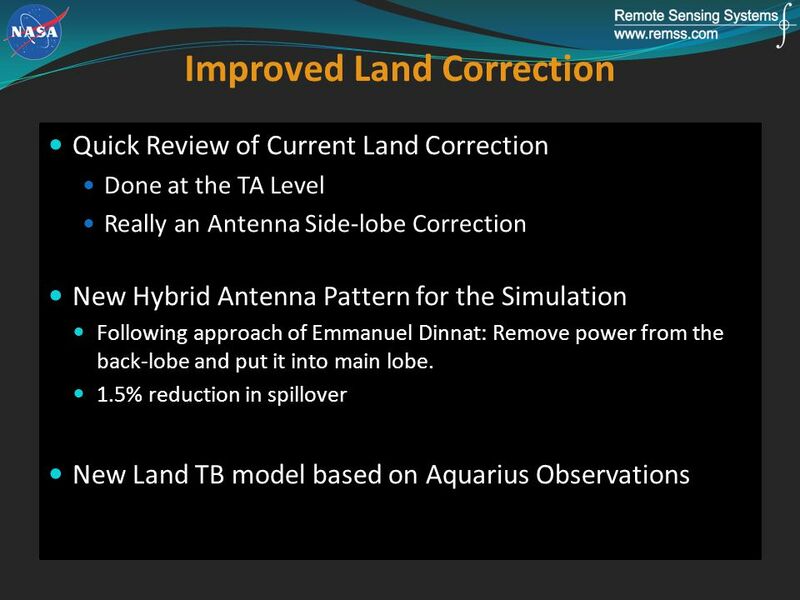 Communicating Uncertainties for Microwave-Based ESDRs Frank J. Wentz, Carl A. Mears, and Deborah K. Smith Remote Sensing Systems, Santa Rosa CA Supported. 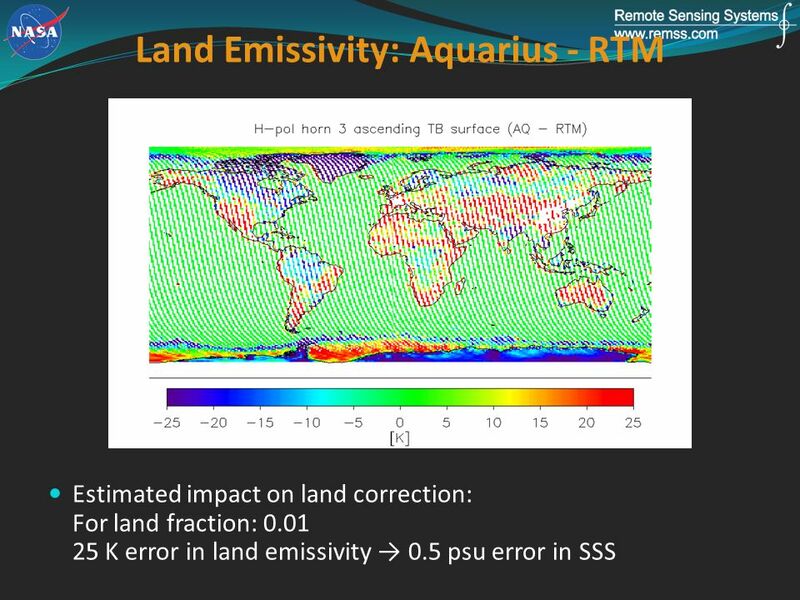 Aquarius Status Salinity Retrieval and Applications D. M. Le Vine NASA/GSFC, Greenbelt, MD E. P. Dinnat, G. Lagerloef, P. de Matthaeis, H. Kao, F.
The Aquarius Salinity Retrieval Algorithm Frank J. Wentz and Thomas Meissner, Remote Sensing Systems Gary S. Lagerloef, Earth and Space Research David. IFREMER EMPIRICAL ROUGHNESS MODEL Joe Tenerelli, CLS, Brest, France, November 4, 2010. 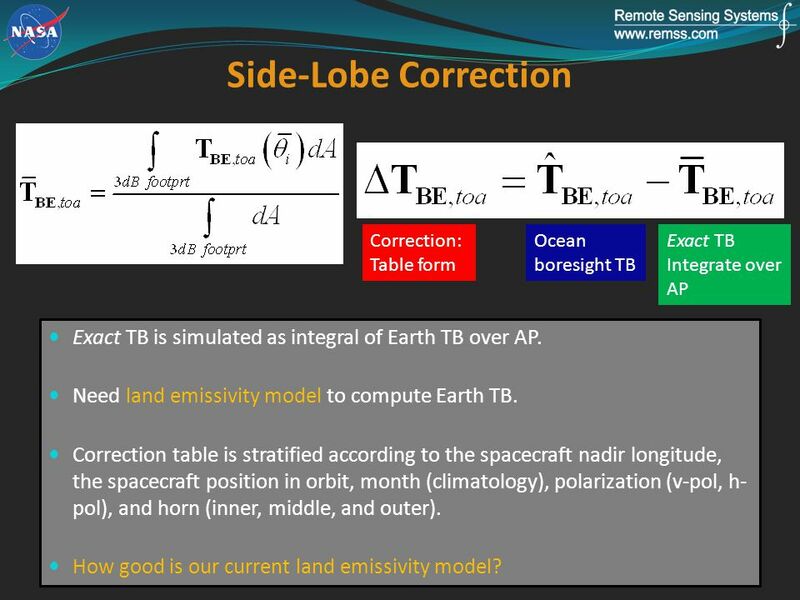 All-Weather Wind Vector Measurements from Intercalibrated Active and Passive Microwave Satellite Sensors Thomas Meissner Lucrezia Ricciardulli Frank Wentz. 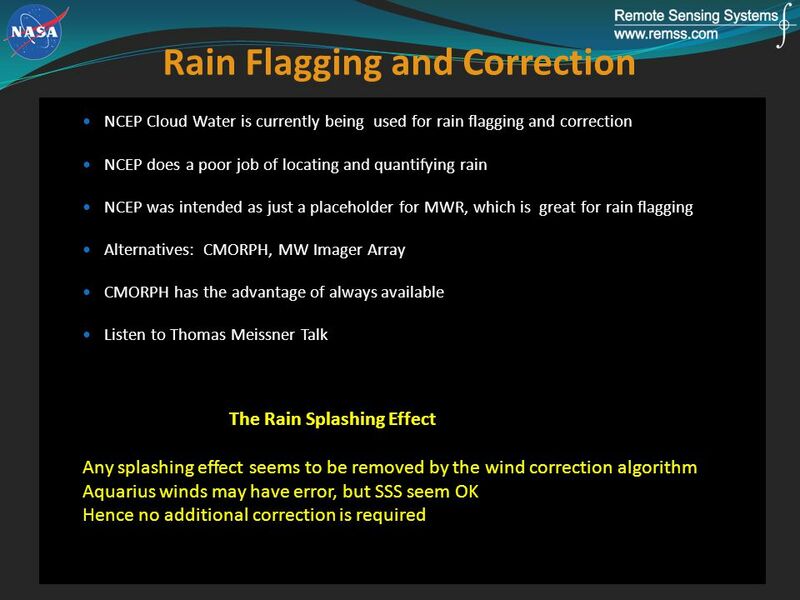 Combined Active & Passive Rain Retrieval for QuikSCAT Satellite Khalil A. Ahmad Central Florida Remote Sensing Laboratory University of Central Florida. 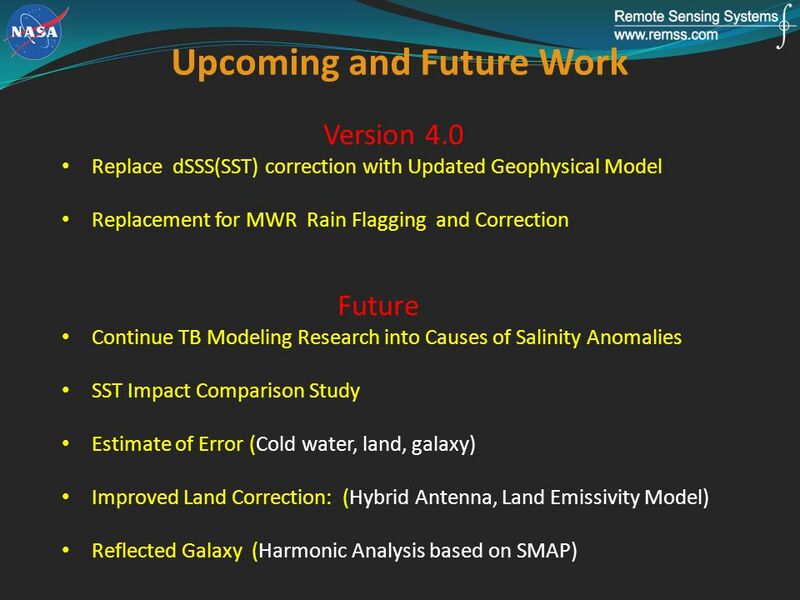 Maintaining and Improving the AMSR-E and WindSat Ocean Products Frank J. Wentz Remote Sensing Systems, Santa Rosa CA AMSR TIM Agenda 4-5 September 2013. 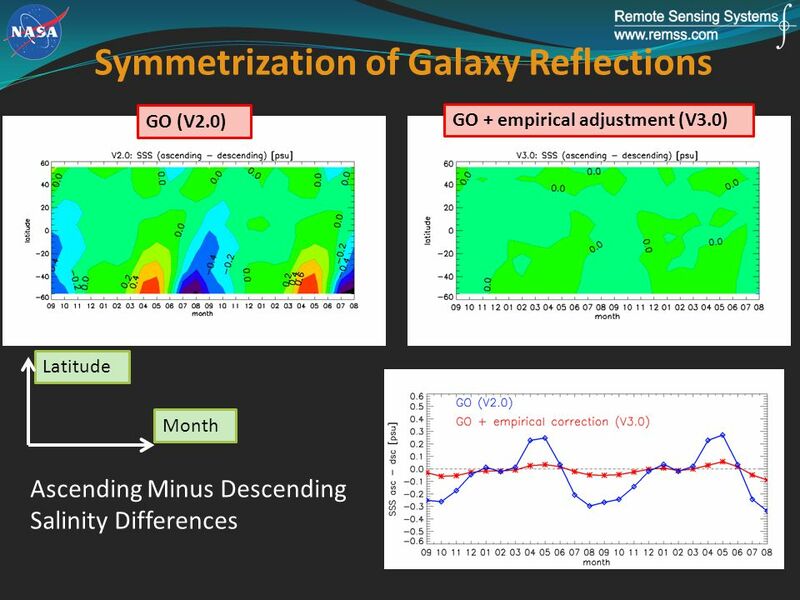 Sea water dielectric constant, temperature and remote sensing of Sea Surface Salinity E. P. Dinnat 1,2, D. M. Le Vine 1, J. Boutin 3, X. Yin 3, 1 Cryospheric. Scatterometer Algorithm Simon Yueh, Alex Fore, Adam Freedman, Julian Chaubell Aquarius Scatterometer Algorithm Team July 19, 2010 Seattle. 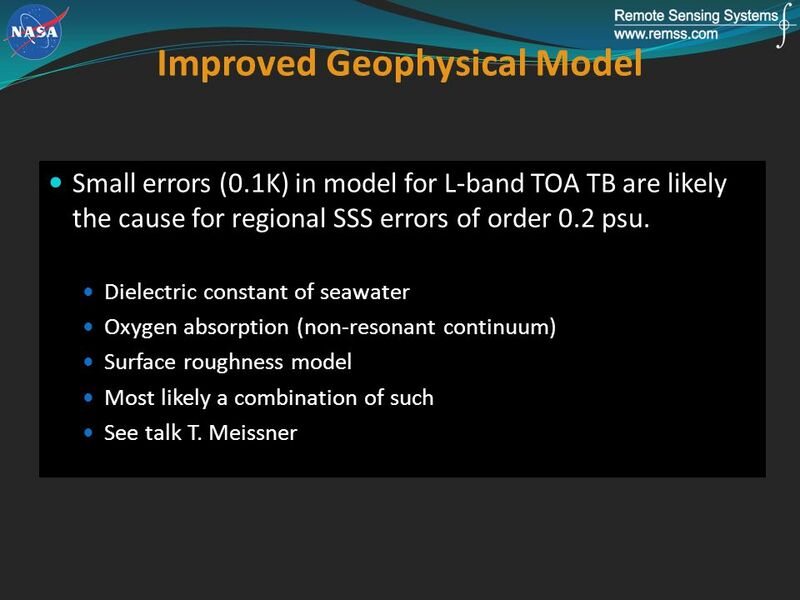 Roughness Correction Working Group Report July 21, 2010 Seattle 6 th Aquarius/SAC-D Science Team meeting. 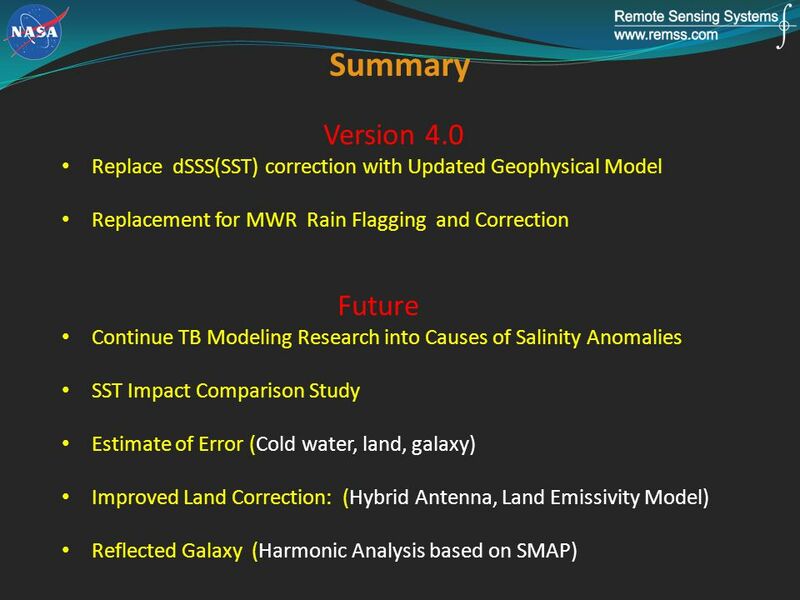 Aquarius/SAC-D Mission Validation Working Group Summary Gary Lagerloef 6 th Science Meeting; Seattle, WA, USA July 2010. 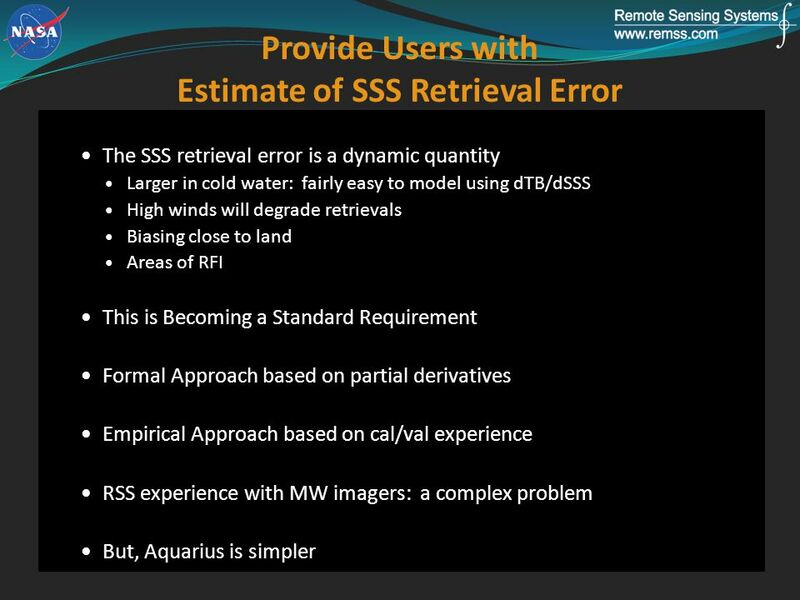 Aquarius/SAC-D Mission Mission Simulators - Gary Lagerloef 6 th Science Meeting; Seattle, WA, USA July 2010. 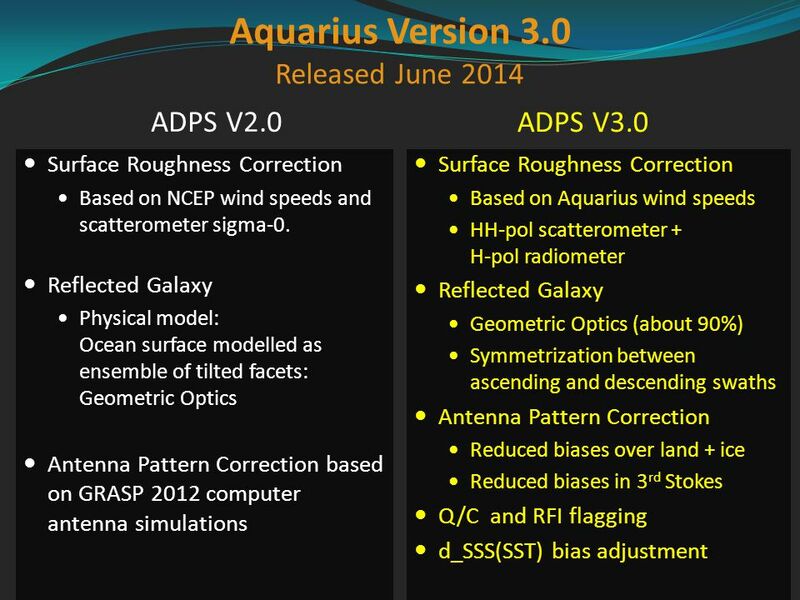 Aquarius/SAC-D Mission Error Validation and Early Orbit Corrections Gary Lagerloef 6 th Science Meeting; Seattle, WA, USA July 2010.